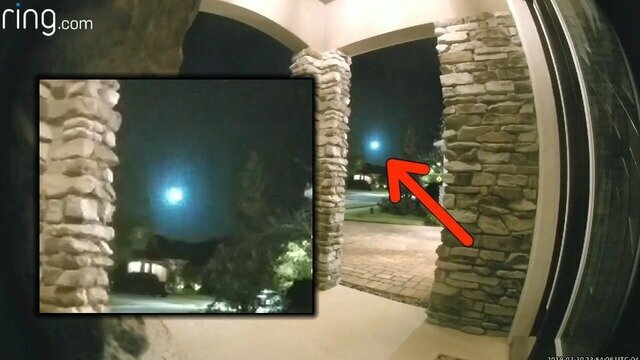 Hundreds of reports have come from the southern United States over the weekend, as a large meteor passed through the skies in a bright greenish blue flash. The meteor could be seen from Florida all the way up to Virginia. It was said to be visible in Florida, Georgia, Alabama, South Carolina, and Virginia. According to The National Weather Service in Tallahassee, the meteor was officially spotted in the southeast portion of the United States on Saturday around 11:52 p.m. EST. Some witnesses reported the fireball being visible for 20 seconds, although most saw it as a briefer flash of just 3.5 seconds, according to the sightings page. An AccuWeather report described the rare sight. “The glow from the burning meteor was so bright that it created shadows for several seconds before the light flickered out,” the report read. The meteor was so bright that it was picked up on weather satellites that are typically used to track thunderstorms and lightning. The meteor, which lit up the sky, was recorded on dozens of dash cameras and doorbell cams. The following dash camera footage was captured by Chad Zetrouer, as he was driving down Newberry road. “I was just in absolute shock, I didn’t know what to do, I took my foot off the gas I kept expecting a bang a sonic boom or something,” Zetrouer said. “All of a sudden above me I saw a light and it goes across the sky comes down and goes down behind the tree at the end of the road,” Zetrouer added. Meteorologist Tim Barry says that sometimes meteors can actually appear to be larger than they actually are. “They can be traveling at speeds estimating around 42,000 mph and they can reach speeds even faster than that and when they enter the atmosphere that is what causes them to glow,” Barry said. Zetrouer said that he had no clue that his video would get so much attention after he posted it online. “I thought when I posted it just the people on twitter would say hey oh that’s cool and that would be the extent of it,” Zetrouer said. Where the meteor landed is still a mystery, but experts warn that it would be like “finding a needle in a haystack.” Meteorologists have speculated that if the meteor did not burn up in the atmosphere, that it may have landed in northern Taylor County. It is strange to think that meteors are constantly passing through the earth’s atmosphere, sometimes getting burned up before they hit the ground, and other times causing massive explosions that are noticed and recorded by researchers but unknown by the rest of the world. “This is also when we refer to them as ‘shooting stars. Sometimes meteors can even appear brighter than Venus — that’s when we call them ‘fireballs. When a meteoroid survives its trip through the atmosphere and hits the ground, it’s called a meteorite,” NASA says. As we reported last month, a massive meteor exploded over in the earth’s atmosphere on December 18th, but the details of the blast have just been uncovered recently. The fireball reportedly flew over the Bering Sea, in the Pacific Ocean between Russia and Alaska. Researchers all over the world survey for signs of disturbance around the clock and many of them initially recorded the blast. Peter Brown at the University of Western Ontario, Canada, spotted the meteor in measurements picked up by at least 16 monitoring stations globally, according to NewScientist. Alan Fitzsimmons of Queen’s University Belfast, UK said that “It would have been quite spectacular,” to see.